Oh why hello there! Welcome to my new blog! 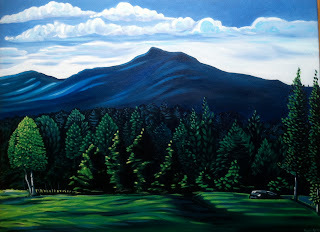 If you're new to me, I am Anna Ayres, an oil and acrylic landscape painter living in Montpelier, VT. In the past few months, I have become overwhelmed with enthusiasm to paint as I begin to explore oils. This blog is an opportunity for me to share insights, inspirations and anecdotes while gaining feedback and wisdom from anyone interested in reading. I am in love with the painting process and have so many ideas bubbling to the surface right now that I can't paint nearly fast enough to share them all! It is my hope that this blog will serve as an outlet for some of this creative energy as I continue to ride this sweet wave! And I will try to limit my use of exclamation marks in the future. Promise. Writing a blog is a little bit like beginning a new painting. There are so many potential options, choices, decisions and edits. The combination of these factors supplies infinite possibility. So it is a tad overwhelming and unless I just accept these words as I write them, I will never achieve complete satisfaction and thus will never publish a single post. So that is my disclaimer. I will do my best, in the present moment, to share honestly and wholeheartedly! Woops, that one slipped out. I travelled down to Rutland, VT two weeks ago for the opening reception of "Women in the Arts: 2012" at the Chaffee Art Center (http://www.chaffeeartcenter.org/) in which I have 9 pieces exhibited until March 17th. It was a wonderful opening: shoulder to shoulder art seekers in the 1895 Victorian mansion that houses the art center, free-flowing wine, snacks, music and especially fantastic art. Eleven female artists comprise the show: all well-spoken, educated, thoughtful, practicing and professional. I left the opening wondering just how I fit in with these established women, feeling like my art was disparate from the rest. While theirs was cerebral, abstract, interesting, unique and technically developed, mine seemed straightforward, too colorful and lacking significance. A Friend's View, 24 x 30". Anna Ayres. This painting began with a significantly different, more natural color palette, but it never felt quite right. It took several revisions (and a few years) before I decided to scrap the more traditional colors and textures and just do what felt natural to me. I lept a little and used my imagination. This is what happened. And then I found The Group of Seven, and it was as though I'd been channeling these artists all along. I completed the painting the next day with confidence. I am so grateful for this happenstance. It revealed to me that I am on track and that there is a place for me amongst the other artists at the Chaffee. There is a place for all of us and the work we do. So long as we are listening and carrying out the agenda of our hearts, we are just where we are meant to be. The reasons evolve as we do. If you have the opportunity to pick this book up, absolutely do. It's gorgeous! I hope to some day see these paintings in person across the border way up north. Until then, I will take comfort in these pages and study these images for inspiration and guidance. I thank you for reading this and look forward to living the next story I will share.